What are the 2019 Honda Insight Trim Levels? Honda’s hybrid lineup has grown by leaps and bounds this year, and although there have been many exciting revelations, some things never change. The 2019 Honda Insight’s trim levels offer premium features and impressive capabilities without breaking the bank. The experts at Consumer Reports have touted this new hybrid sedan’s “ride quality, cabin quietness, and efficiency,” and it’s worth noting that their praise applies even to the 2019 Insight LX E-CVT baseline trim, priced at $22,830 MSRP. * Hampton Roads drivers who explore this model’s LX, EX, and Touring packages will find dozens of high-quality amenities and features to enjoy day after day. Read on to find the Insight that’s right for you. The Insight’s baseline LX trim level may be less expensive, but it’s anything but spare. Innovative powertrain and drivetrain components allow this practical Hybrid to excel across all environments, and as with many new Hondas, next-generation safety components come standard. 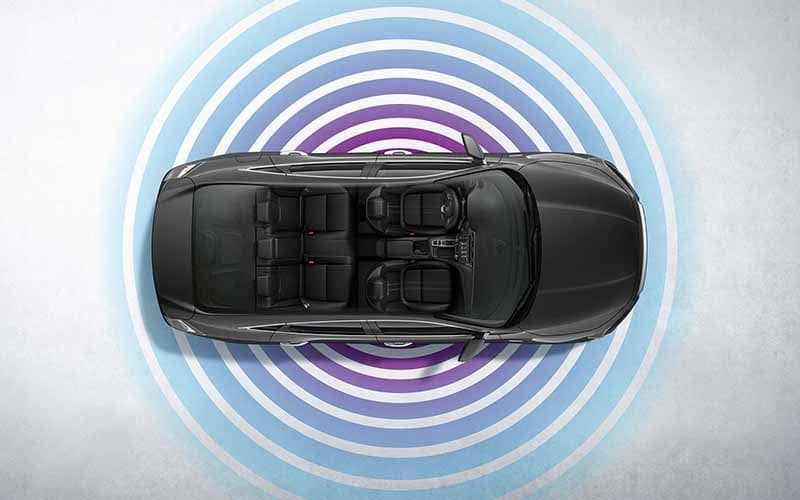 Honda Sensing: Honda’s celebrated safety package features Adaptive Cruise Control, a Collision Mitigation Braking System, a Lane Keeping Assist System, and a Road Departure Mitigation System. Together, they act like a second driver at the wheel to help you relax and stay out of danger. 3-Mode Drive System: When you’re at the wheel of the Insight, you’ll be able to switch between three distinct driving modes. Sport Mode lets you take full advantage of your 4-Cylinder engine’s power, while EV mode transfers full control to your AC Synchronous Permanent Magnet Electric Motor. ECON Mode works with your Eco Assist feature to help your Insight move more efficiently while keeping both your engine and your electric motor engaged. Multi-Angle Rearview Camera: Protect your Insight from minor dents and dangers using its rearview camera, which features wide-angle, normal, and top-down viewing modes. Guidelines come standard here, and Dynamic Guidelines are offered on the EX trim and up. Drivers who upgrade to the Insight’s EX trim level will dramatically expand their entertainment options, and they’ll gain access to convenience features that save time and energy. The 2019 Insight EX E-CVT is priced at $24,060 MSRP*. 8-Inch Display Audio System: Take control of your Insight’s technology features using the EX’s 8-Inch Display Audio high-resolution touch screen. The system’s responsive button tiles are customizable so you can tailor the interface to respond to your needs. The system also includes hard keys and a live volume knob. Ease-Of-Access: No one wants to waste time fishing for their keys when they’re trying to get on the road! 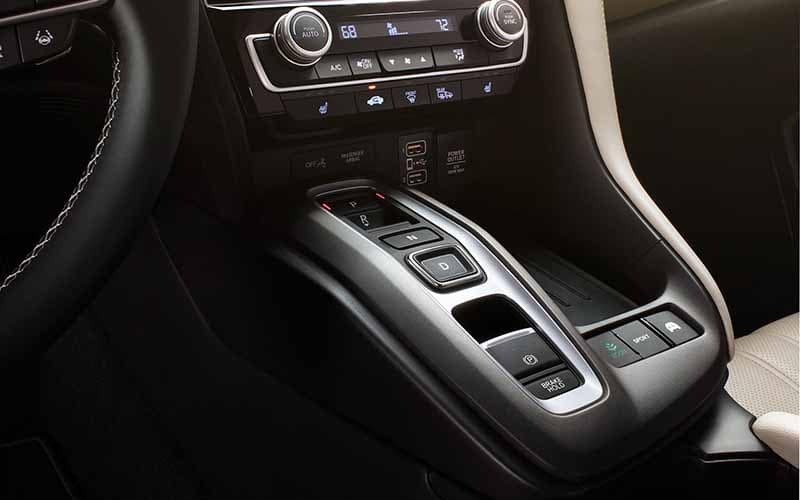 Push Button Start comes standard in the Insight’s LX trim, and those who upgrade to the EX can take advantage of Smart Entry, Walk Away Auto Lock, and Remote Engine Start. 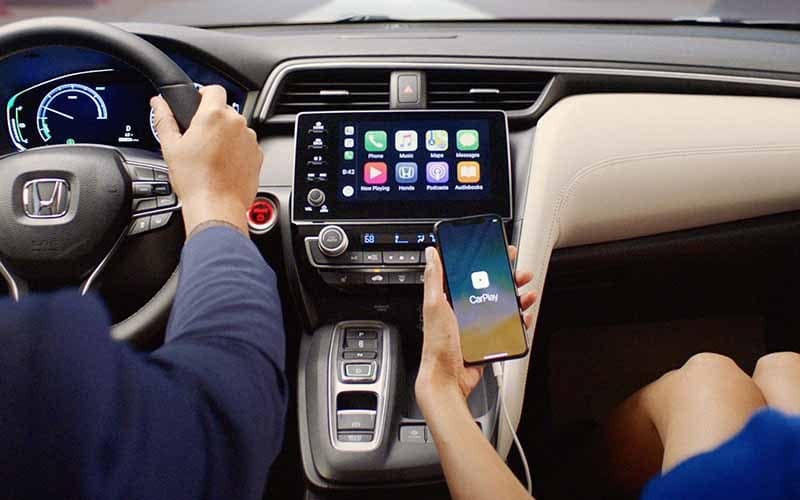 Smartphone Connectivity: In the EX trim level and up, drivers can connect a compatible smartphone to their Insight using the HondaLink app, which provides reminders, scheduled service updates, detailed vehicle guides, and more. You’ll also be able to play your music using the Apple CarPlay and Android Auto smartphone interfaces. Honda LaneWatch: The Honda LaneWatch security system lets you check your blind spot without turning in your seat. Just activate your right-hand turn signal, and a small, centrally located screen will display a live feed of this normally hard-to-see area. Driving a Hybrid doesn’t mean sacrificing the finer things. In fact, with the Insight’s savings at the pump, it’s easy to justify opting for a few upgrades. Enjoy premium interior features in the 2019 Insight Touring E-CVT, priced at $28,090 MSRP*. Leather-Trimmed Interior: With the Touring upgrade, the Insight’s standard cloth interior is replaced by a Leather-Wrapped Steering Wheel and Leather-Trimmed Seats. Here as well, the Insight’s front seats have been equipped with three-level heating. 450-Watt Audio System: The Insight’s Touring trim features a powerful 450-Watt Premium Audio System with 10 speakers, including a subwoofer. It replaces the EX’s 180-Watt 8-Speaker alternative. Satellite-Linked Navigation System: With Honda’s Satellite-Linked Navigation System, you’ll be able to take advantage of HD Digital Traffic updates, a 3D view of your surroundings, predictive local search technology, and of course, turn-by-turn directions. The whole system can be controlled with voice commands so you won’t have to take your hands off the wheel. Mobile Hotspot Capability: With a subscription, the Honda Insight’s Touring trim can act as a fully functional mobile hotspot to keep you connected on the go. It’s never been easier to stay plugged in to your favorite entertainment and information sources and friends! Drivers who like what they see in the Insight can take their favorite model for a test drive today! No matter which Honda Insight trim level best fits your lifestyle, there’s never been a better time to take advantage of our current offers. Visit your local Hampton Roads Honda dealer today to get a great deal on a hybrid car you’ll love to own.